﻿ Put-in-Bay - Ohio. Find It Here. 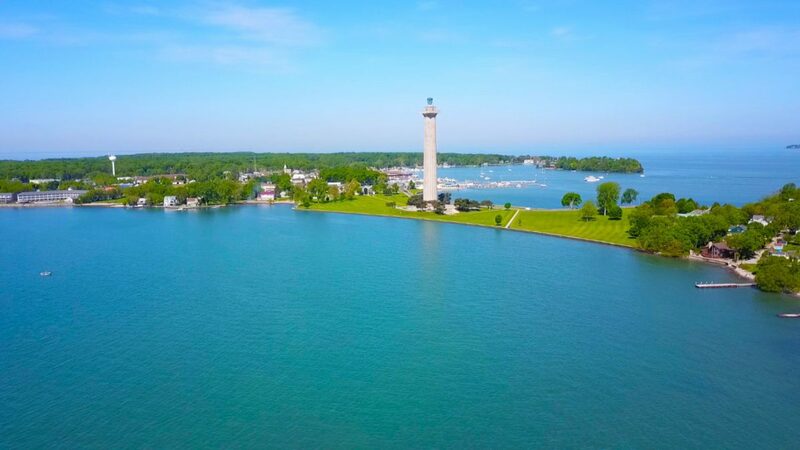 Put-in-Bay, also known as South Bass Island, is located in the Ohio portion of Lake Erie's western basin. South Bass Island is a popular summer destination reachable be ferry, plane or personal watercraft. Put-in-Bay is a village located on South Bass Island. First settled in the 1850s it is known for Victorian architecture, island wines, caves, Ohio State University Stone Lab and the iconic Perrys Victory and International Peace Memorial. Perry's Victory, built in 1913 to commemorated Oliver Hazard Perrry's victory in the Battle of Lake Erie in 1813, is run by the National Park Service. Visitors can reach Put-in-Bay in season via ferry from Sandusky, Catawba Island (part of Port Clinton), and downtown Port Clinton, Ohio. With over 24 restaurants to dine in, and an array of hotels, bed and breakfasts, homes and cottages visitors can come for a day or stay for an extended vacation. Golf carts, taxi-cabs and a downtown bus provide on island transportation. Our regular season is from early May until the end of October. For the most up to date information on events, lodging while visiting Put-in-Bay, South Bass Island, Ohio check out www.visitputinbay.com or call us at 419-285-2832.